Turn your operations procedures into self-service jobs. Safely give others the control and visibility they need. Github Issues Found a bug? File or check on an issue. Vote on Features Have a project idea? See if it makes the roadmap. Reduce mean time to resolution (MTTR), reduce escalations, and lower your support costs. Collaborate on standard operating procedures. Provide subject matter experts with safe, limited access to sensitive environments. Integrate with monitoring and ticket systems. Satisfy auditors with Rundeck’s history of all activity. Safely delegate to others the ability to execute jobs or watch job execution -- all depending on the permissions you give them. Relieve the pressure on operations by allowing other people and tools to define and execute the operational procedures they need. Move fast, stay in control, and be secure. 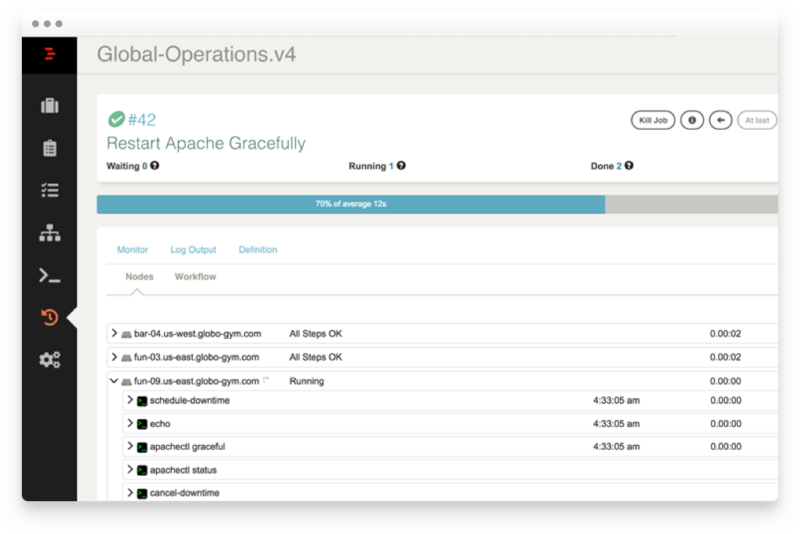 Coordinate the automated deployment of any application across any environment. Trigger your deployment jobs manually or have your build or CI server trigger deployments automatically. Rundeck can also execute your post-build deployment verification testing. Create jobs that support your data management and analytics needs. Connect to different data sources to run scripts and transfer files between data processing tools. Quickly capture the knowledge of your data experts as standard procedures that can be shared throughout your organization via Rundeck’s secure self-service capabilities. Need support, training and high availability?